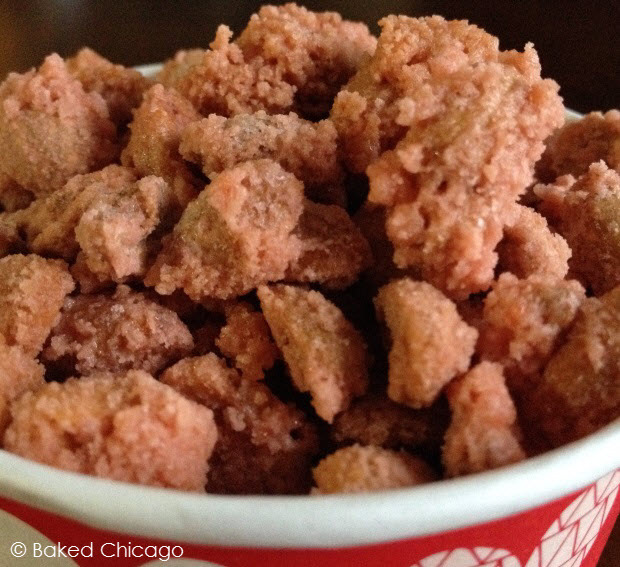 I think everyone waxes a bit nostalgic when it comes to memories of favorite childhood treats. When I think back to the sodas and snacks I had as a kid, I’m kind of surprised at how they’ve evolved over the years. The simple, delicious M&Ms® reigned supreme for Halloween trick-or-treating and the Snickers® candy bar was the new kid on the block. Today, there are so many varieties and flavors – in addition to the original versions – it can make your head spin. Even soda has changed exponentially. As a kid, I remember stopping at the park canteen after swimming lessons for a fountain Green River® soda. I can’t tell you what the flavor tasted like, but I remember I obsessed over it. Back to snacks (everything always comes back to snacks, right?). One of those childhood candies that appears to be no more is French burnt peanuts. 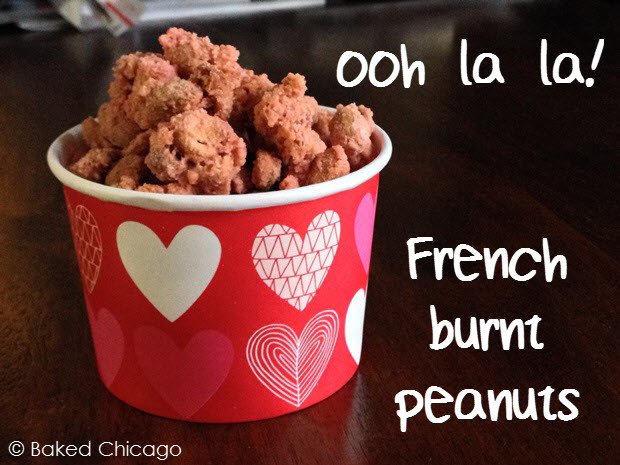 Specifically Brach’s® French Burnt Peanuts. If you’ve ever had them, you know exactly what I mean. 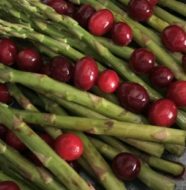 They were crunchy and sweet and oddly bright red. And oh so addictive (the sugar, right!). Every know and again I get a craving for those French burnt peanuts and for a few years I was able to locate them online via Amazon. But in my latest search, I realized that the Brach’s version of French Burnt Peanuts has gone away. 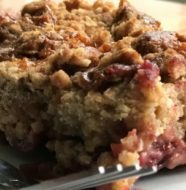 I searched and searched online for possible recipes to recreate the flavors, but nothing I found online really recreated the right texture and colors. So I decided to give it a try to adapt some of the better recipes I found to see if I could get just a few steps closer to that Brach’s standard that I so fondly remembered. You only need 4 ingredients: peanuts, sugar, water and food coloring. You put all the ingredients in a pot and heat over medium-high until all the moisture had evaporated. At first, it will feel like it’s taking too long. You’ll wonder if you’re doing something wrong. Be patient. The mixture needs to boil, or in this case foam, to help with the transformation of the coating. Regularly stir the mixture to ensure even coating. The last few minutes will rapidly accelerate as the sugar and water foams; watch closely because if all the water is gone the remaining sugar may easily burn. The mixture will be very sticky and dry. Now you’re ready to bake them in the final step. 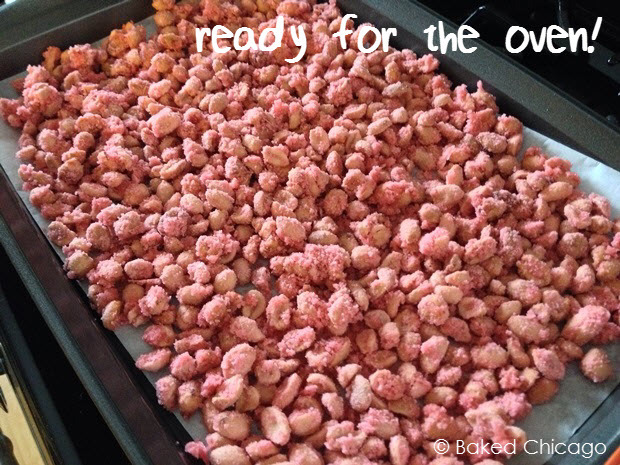 You’ll notice from the above image before you pop them in the oven that the color is a bright pink / light red. I tried a number of variations in the food coloring but never really got past light red. Something tells me the vibrant red color burned into my childhood memories “may” be un-achievable with today’s food coloring. Stir the mixture every 15 minutes. When done, let cool completely and store in an airtight container. While the final product doesn’t have the same dark red color of the original, these French burnt peanuts taste as good, if not better, than the childhood snack I remembered. And with this end-product, I can actually taste the quality of the peanuts and brown sugar. 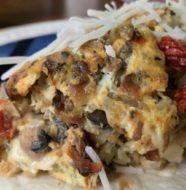 They say you can’t go home again, but in this case I think this recipe got darn close in some respects and totally hit the mark in most. Preheat your oven to 250F degrees. Line a jelly roll with parchment paper and set aside. Combine all of the ingredients in a heavy saucepan. Cook over medium-high heat, stirring constantly, until moisture evaporates. Spread out the peanuts on the prepared pan. Bake for 45 minutes, stirring and breaking up large clumps every 15 minutes. Let cool completely and store in an air-tight container for up to 10 days.